For stamps inscribed Zanzibar Revolutionary Government, issued since Zanzibar became part of Tanzania in 1964, see A1/11 and S1/6. Acknowledgments for Zanzibar can be found on the main East Africa page. The stamp illustrated above was sold on eBay in June 2012. It is a Special Adhesive stamp of India overprinted Zanzibar in mixed case, similar to the postage stamp provisionals of 1895-96. I can find no prior record of this overprint being found on revenue stamps, but in my view it looks genuine and could be the earliest revenue stamp of Zanzibar. I would be grateful to anyone who can provide further information which might allow this stamp to be authenticated. The stamp illustrated at right (which also appeared on eBay in summer 2012) shows a similar overprint on the Foreign Bill 12a stamp of India, but in this case the overprint is clearly bogus, having poorly-formed letters and an weak impression. 1892-94. Stamps of India overprinted ZANZIBAR (19½ x 2½ mm) by De La Rue. Perf 14. 1. All values are known with CANCELLED overprint, emanating from the De La Rue archives. 2. The dates in brackets in the above listing are taken from a De La Rue archive sheet bearing a complete set (opt CANCELLED), with a date written above each value in manuscript. It is not known whether the dates indicate when the stamps were printed or when they were dispatched from London, but in either case they were very probably issued in Zanzibar no more than a couple of months later. 3. 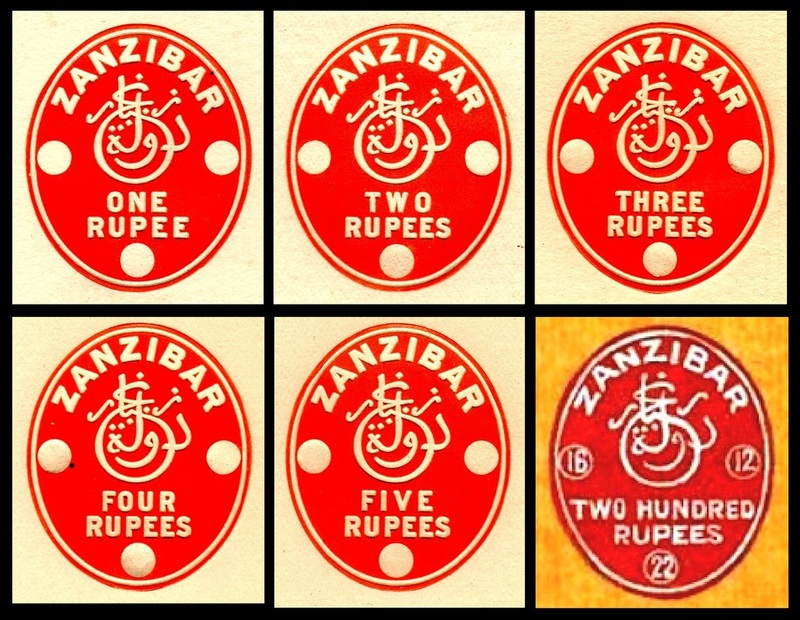 Examples of the one-anna receipt stamp are known with a forged ZANZIBAR overprint on the common Indian stamp, produced presumably in an attempt to defraud philatelists. The letters of the forged overprint are too narrow and the top of the Z is raised above the line, as shown in the illustration above. 1904 (according to Barefoot). Provisional manuscript surcharges on the above issue. 2. Manuscript surcharges such as these are easy targets for forgers. Buyers should beware of paying high prices for such items. 1904 (according to Barefoot). Printed provisional surcharges on the 1893 issue, with three different types of surcharge. Note: Barefoot additionally lists the 1r on 8a with this type of surcharge in red, though I have not seen this and suspect it may be an error for the sans-serif surcharge (see R51 below). 1. The violet surcharge on R51 can sometimes appear either red or blue. 2. One example of R51 was reported (and subsequently listed in Barefoot) as being surcharged at left only. Close examination of the stamp revealed that it was a normal example of R51 but with the right-hand part of the surcharge hidden almost completely by the cancel. 3. Barefoot additionally lists the 3r on 2r with this type of surcharge, though I have not seen this. 1899-1901 (Gibbons date for issue of postage stamps). Postage stamps of Zanzibar (Sultan Seyyid Hamoud bin Mahommed bin Said) overprinted Revenue in mixed case (15½ x 3 mm), probably by a local printer. Stamps measure 25 x 30 mm. Perf 14. Wmk single rosette. Printed (recess) De La Rue. Flags and lines at edges of stamps in red. 1905 (according to Barefoot). Issue of 1899-1901 surcharged with the figure 1 (4 mm high), cancelling original figure of value at left and right. 1906 (earliest recorded example). Postage stamps of Zanzibar (monogram of Sultan Seyyid Ali bin Hamoud bin Naherud) overprinted Revenue in mixed case, probably by a local printer. Perf 14. Wmk multiple rosettes. Printed (typo) De La Rue. b) 25 x 5 mm overprint on stamps measuring 25 x 29½ mm. Flags and lines at edges of stamps in red. 1907 (based on printer's archive material dated late 1906). Similar to previous issue but overprinted REVENUE in bold capitals (15 x 3 mm on 1a, 19½ x 4 mm on others) by De La Rue, or surcharged also. Flags and lines at edges of stamps in red on rupee values. Notes: Morley also lists a 1r on 12c (possibly an error for the 12c of 1908-09?) in this series, and Gibson lists a 2a and 4a in this series, but I have not seen any of these. From 1908 onwards, dual-purpose postage and revenue stamps were used (see section below). High values inscribed Revenue (see R121/2) were issued to accompany the 1936 definitives. 1930? As 1926-27 postage and revenue issue but overprinted GOVT SAVINGS BANK in seriffed letters 2½ mm high. It is unclear whether this was a savings stamp or simply a company chop. 1936 (according to Crown Agents archive). Similar type to F322 (see below) but inscribed REVENUE at foot. 30 x 25 mm. Perf 14. Wmk Multiple Script CA. Printed (recess) by De La Rue. Sheets of 100 (10 rows of 10). Note: the 50r was originally proofed in black and brown-orange, but this was rejected in favour of using the same colour for both head and duty plates. 1964. Revenue stamp of 1936 locally handstamped JAMHURI (=Republic) 1964 (diagonally, horizontally or vertically). 1966. As F461 etc (see below) but locally handstamped REVENUE (15 x 2 mm) in violet. 5c, 15c, 50c, 1s, 2s, 5s, 10s, 20s. 1970. New small pictorial types inscribed Pato (=Revenue). 21 x 17½ mm. Perf 14 x 15. No wmk. Printed (offset-litho) by Harrison. Sheets of 100. 1. Details of the above issue, derived from the Crown Agents archive in the British Library, were first published in Michael Vesey-Fitzgerald's 'Zanzibar Revenues: A Revision', B.E.A. (The Bulletin of the East Africa Study Circle), Vol 15 No 98 (May 2011). He notes that the stamps were dispatched to Zanzibar on 12th January 1970. 2. The values in brackets are known from the printer's archive in the British Library but have not been recorded hitherto as issued stamps. c2000-18 (see note 1). Arms of Zanzibar. 17 x 20½ mm. Perf 15 x 14 (1s) or perf 13 x 13½ (others). No watermark. 2018 (first recorded). Arms of Zanzibar. 19 x 20 mm. Roulette 10. No watermark. 1. R178/9 and R181 were on sale at Zanzibar Revenue Board offices in October 2018. R171 is listed in the 2019 edition of Barefoot with a suggested issue date of c2000. 2. Plate numbers recorded: 5000s Plate 1A. Printers: all the following stamps were printed (recess) by De La Rue unless otherwise stated. 1904. Monogram of Sultan Seyyid Ali bin Hamoud bin Naherud. 25 x 30 mm. Perf 14. Wmk Multiple Rosettes. Printed (typo) by De La Rue. 1908-09. Sultan Ali bin Hamoud (1r to 5r) or view of Zanzibar Port (10r to 200r) in horiz format. 25 x 30 mm (vert) or 30 x 25 mm (horiz). Perf 14. Wmk Multiple Rosettes (sideways on 10r to 30r). 1913. Sultan Kalif bin Harub (cents values), Native Craft (1r to 5r) or Dhow (10r to 200r) in horiz format. 18 x 22 mm (cents), 25 x 30 mm (1r to 5r) or 30 x 25 mm. Perf 14. Wmk Multiple Rosettes (sideways on 10r to 200r). 1914-22. As previous issue but wmk Multiple Crown CA. 1921-29. As previous issue but wmk Multiple Script CA (sideways on 10r). 1926-27. New cents values with changed portrait of Sultan Kalif bin Harub, CENTS in seriffed capitals. 18 x 22 mm. Perf 14. Wmk Multiple Script CA. 1936. Similar type but CENTS in sans-serif capitals on low values, high values with currency in shillings instead of rupees. 19 x 22½ mm (cents values), 25 x 30 mm (1s to 7s50) or 30 x 25 mm (10s). Perf 14 x 13½-14. Wmk Multiple Script CA. 1946. As F311 but overprinted VICTORY ISSUE 6TH JUNE 1946 in red. 28½ x 37 mm. Perf 11½ x 11. Wmk Multiple Script CA. 1952. New portrait of Sultan Kalif bin Harub (cents values) or Seyyid Khalifa Schools (shillings values). 18 x 22 mm. Perf 12½ (cents values) or 13. Wmk Multiple Script CA. 1957. Pictorial issue. Map (35c), 28 x 22 mm, perf 14 x 13½. Kibweni Palace (10s), 21 x 36½ mm, perf 13 x 13½. Wmk Multiple Script CA. Printed (recess) by Bradbury Wilkinson. 1964 (Jan-Feb). Pictorial issue of 1961, with various designs bearing portrait of Sultan Sir Abdulla, now overprinted JAMHURI (=Republic) 1964. 1966. New pictorial designs, 39 x 21½ mm, perf 13 x 12½. No wmk. Printed (litho) by German Bank Note Printing Co, Leipzig. Illustrated here are proofs for impressed stamps denominated from 1r to 5r, plus an essay for the 200r, all in vermilion. The essay is dated 14 January 1922 in the margin (though the date plugs show 16-12-22). No other examples have been recorded to date, and it is not known whether these stamps were ever issued. c1990s. Arms of Zanzibar with aeroplane. 37 x 26½ mm. Perf 15 x 14. No watermark. Note: A1 is not recorded without the T SH 1000 handstamp (as A3) but is presumed to exist. 2005 (recorded usage). Label inscribed ZANZIBAR REVENUE BOARD airport service charge. Imperf. Security background of text in wavy lines. Denominated USD with blank space to allow the value to be inserted by handstamp. Security number in black at right. 1993 (earliest known usage). Seaport Departure Service Charge. Arms of Zanzibar with ferry. 37 x 26½ mm. Perf 15 x 14. No watermark.